Wedding PR: Huffington Post, The Knot, SheFinds, and more! Hooray for Friday! We’ve got a great round up of client press features we are so happy to share including Huffington Post, The Knot, SheFinds and so much more! See it all below. 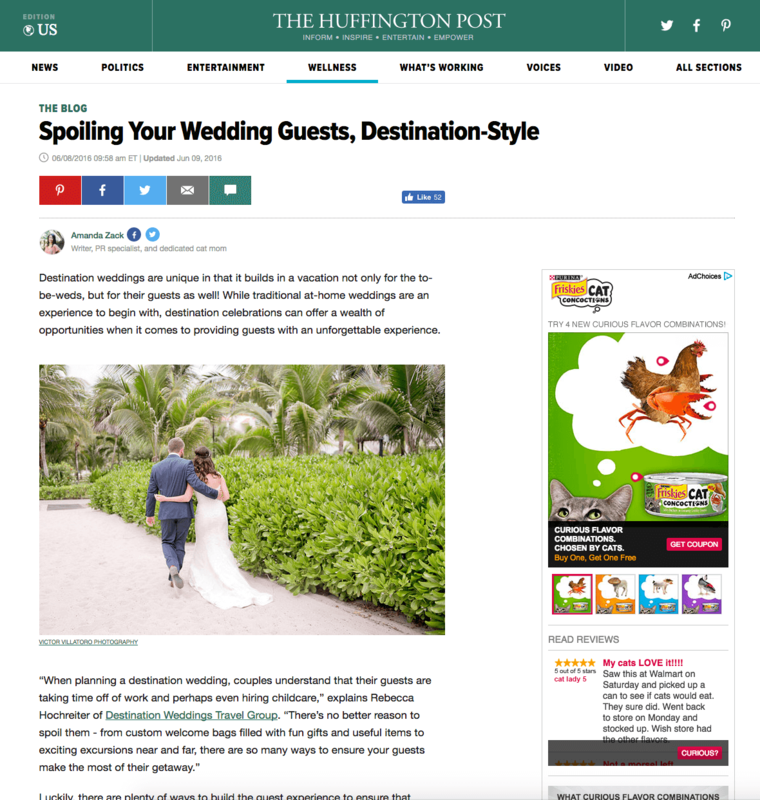 Rochelle Cheever, Destination Weddings, Where Will They Stay?, and Cocoon Events Group were featured on Huffington Post in the article Spoiling Your Wedding Guests, Destination Style. See the full article here! Azazie was featured on SheFinds in a roundup on the most common mistakes millennial brides make. See the full feature here! Stephanie Yonce Photography was featured on Weddings Unveiled with Courtney and Justin’s Charlottesville wedding. See the full feature here! Destination Weddings was featured on The Knot in the article Try These 7 Fun Excursions for Welcome Dinner Alternatives! See the full article here. Cocoon Events Group had a guest article featured on Wedding IQ called Event Day Management: Destination Wedding Style. See the full feature here. OFD Consulting was featured on US News as expert commentary in the article Paying for a Wedding: 5 Questions Parents Should Answer Now. See the full article here! Stephanie Yonce Photography was featured on Tidewater & Tulle with a real wedding at The Country Club of Virginia. See the full feature here. Cocoon Events Group and Azazie were featured in the Brides.com article The Key to Involving Your Stepmom in Wedding Planning. See the full article here. Mike B Photography was featured on Bayside Bride with Trevor and Lauren’s Garden Wedding. See the full feature here. OFD Consulting had a guest article on WeddingWire EDU about crafting an award-winning submission. See the full article here.